At ACTEX Learning, we listen to the needs of our students and do our best to help you succeed in achieving your goals. With that in mind, we have options that make our VEE courses more convenient for you. 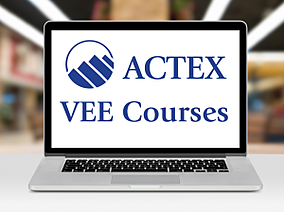 We offer computer-based testing (CBT*) for all of our VEE courses and ProctorU** , a remote proctoring option. Our on-demand VEE Courses with CBT final exams will allow students to choose their exam date and time with no restrictions. *Computer-based tests are randomly generated from a question bank and are unique for each test. Paper & pencil tests are all the same and therefore fall into a more stringent security protocol. As a result, only CBT test qualify for flexible scheduling. **Students are responsible for creating an account and paying ProctorU directly for their proctoring services. ACTEX does not profit from your use of their services.